A maximum of 8 attendees only! This is a FREE course, With 200 page training manual written specifically for this class. W2IK and The Bexar Operators Group (W5BOG) located in San Antonio, Texas, will sponsor their 6th annual “Jump Team Boot Camp” in 2014, commencing on April 4th (Friday AFTERNOON) and running through the 6th (Sunday AFTERNOON). Our “Jump Boot Camp” will concentrate on the ways and means to get a “Jump Team” operational should there be a need to deploy far from your home and communicate in the aftermath of a disaster where nothing is standing. Just like the other “Jump Team Boot Camps” we’ve taught, this will be an actual drive-and-operate operation and NOT a desktop drill. This is the “no BS, real deal” of emcomm training and is as close as it gets to an actual disaster. The only emcomm boot camp in the country! You will get very dirty so bring extra clothes! You will test your personal limits. You will leave with self-confidence in dealing with extreme emergency communications work. ECs and AECs from any group are especially encouraged to attend so they can bring valuable information back to their group(s) and so they are aware of what any of their members will be facing when you ask them to deploy to an extreme disaster area. Participants for this session will meet at a central staging area in San Antonio, TX. Pre-deployment maps will be given out at this time. When the destination has been reached, all participants will assist in the construction of shelters and operating areas. We will be teaching the proper way to do a site evaluation before any structure is erected in order to avoid problems which could be encountered should weather take a turn for the worse (additional rains, flooding and/or high winds). We will be supplying energy to operate using two types of power: gas generation and solar generation to power our deep cycle battery operation, with instruction on the set up and safe operation each system. Even our lighting system will be powered by deep cycle battery. The lighting alone is like nothing you’ve ever seen before! Since it is important that every Jump Team member have a firm grasp of all aspects of setting up and operating during an emergency, special emphasis will be placed on the logical sequence of setting up (structures, power and antennas including NVIS antennas), meeting nutritional requirements (basic cooking and meal planning), station operation, message logging/handling (using BOTH NTS and Plain Text messaging), band propagation as well as the proper method to filter (local) water using a unique filtering system for emergency needs (which you will be given plans for) and how to interface with local government. Also be aware that the actual destination will not be a local park so like an actual emergency communications deployment we will have to bring everything that we need including every ounce of water. This location might be a truly primitive site! Along with instructions during each phase of setting up and operation, there will be short lectures and fire-side discussions. We will check in to various HF nets during our operation and pass mock traffic (NTS and Plain Text) to stations who will be awaiting our messages. We will also operate as a special events station where, if proper procedure and a short message is handled, contacting stations will receive a special certificate, a “Jump Team Boot Camp” tee shirt and additional items. All communications gear, antennas, shelters, instructional booklets and food will be provided. For the first time, we will also include how to do “long-term” food storage so any food your group wishes to store with your emergency stash will last 20 years. Participants will be eating food that has been properly stored and most of it will be over 5 years old. Participants will be given a short list of what they need to bring (personal items, sleeping bags, extra clothing. etc). A special “Jump Team Boot Camp Manual/Workbook” will be supplied to each attendee. At the end of the boot camp, attendees will be given a certificate of course completion. This event will be limited in the number of attendees (6-8). We will have to bring everything we need or do without! This will be very rustic in nature. Cell phones, again this year, will NOT be allowed (keep them in your car and you can not check them). You do not need to be a member of any group to attend. We accept all groups or individuals regardless of experience. 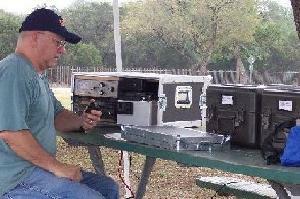 You don’t even have to be a licensed amateur radio operator! You DO need a sincere desire to assist during a disaster. Do not register if you think this is some feeble “Field Day” operation or to inflate your ego. Register to come only if you wish to learn how to properly operate as a team of emergency communicators and gain the confidence and skill needed in the face of any disaster. Register as soon as possible to avoid being cut off after the maximum number of registered attendees has been reached. DO NOT REGISTER UNLESS YOU MAKE A FIRM COMMITMENT TO ATTEND AS THE FUNDS SPENT FOR THIS EVENT, SEVERAL HUNDRED DOLLARS, COMES DIRECTLY OUT OF MY OWN POCKET. IF YOU REGISTER BUT DO NOT SHOW, YOU MIGHT BE DENYING SOMEONE WHO WISHES TO ATTEND BUT ATTEMPTS TO REGISTER AFTER THE MAXIMUM NUMBER HAS BEEN REACHED.